The Patio King Rooms are on our walk-out level. To get to the walk-out level, there are stairs going down on the outside of the building. Every unit has has a great view of the water. These units are nice for groups as they have easy access to our patio tables. Each 300 sq.ft. room has its own divided patio with two chairs and a small table. They are also located on the same level. As our swimming pool and indoor whirlpool. They are nicely furnished with new carpet and new comforters. 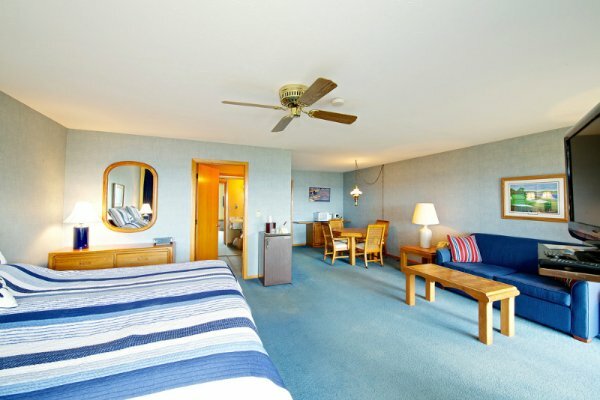 These rooms have two Queen sized beds and a private balcony overlooking the water. They are 300 sq.ft. like the Patio King rooms, only up one level. Each room has a beautiful view of the water. 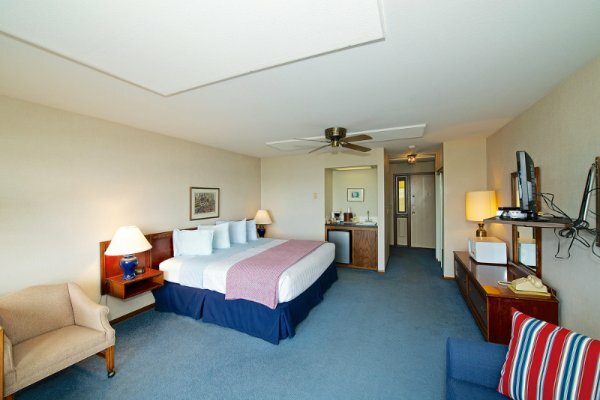 These rooms are nicely furnished with new carpet and bedspreads. 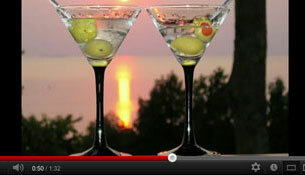 They are located on the parking level, but walk-out to a balcony overlooking the water. Both the Patio King and Balcony Two Queen have all the amenities of our other units. These 400 sq.ft. 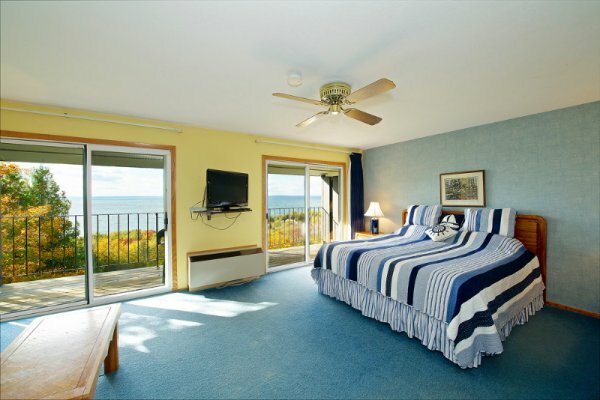 rooms have a nice size private balcony overlooking Green Bay waters. They are larger than the Patio King and Balcony Two Queen rooms. Each room has a beautiful view of the water. The bathrooms are a bit bigger and they also have a pull-out sofa ane wet bar. These units are located in their own building a short distance from the main building. A pretty terrace with a fountain separate the the two buildings. There are five units on the street level with balconies and five units on the upper level with balconies. They are spacious and nicely decorated. Like the other rooms they include a coffee maker and refrigerator and the other amenities. There are only two of these fantastic units. They are on the top floor, which is actually the third level of the main building. They are spacious and include a set of sliding glass doors out to a private balcony. These rooms are 500 sq.ft. and include a full sized table and chairs, a dry bar and pull-out sofa. Of course they have all the amenities of our other units. The bathroom includes a private dressing area with sink and full closet with mirrored doors. They are nicely furnished with new carpet and comforters along with prints from local artists. These are very special units with a spectacular view. For those who would like something extra special, our Stonehearth Suite is a magnificent 1200 sq.ft., 2 bedroom (king beds) and 2 bathroom suite. 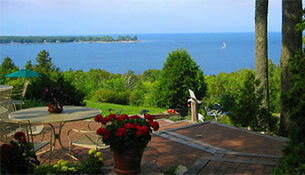 It includes a full kitchen, living room with a beautiful Door County stone fireplace. Sliding glass doors in the living room and both bedrooms open up to 50 feet of private balcony overlooking the waters of Green Bay. It also has its own whirlpool room with its own double whirlpool bath. The kitchen includes all dishes, pans and all utensils. It is located on the top floor of our main building. 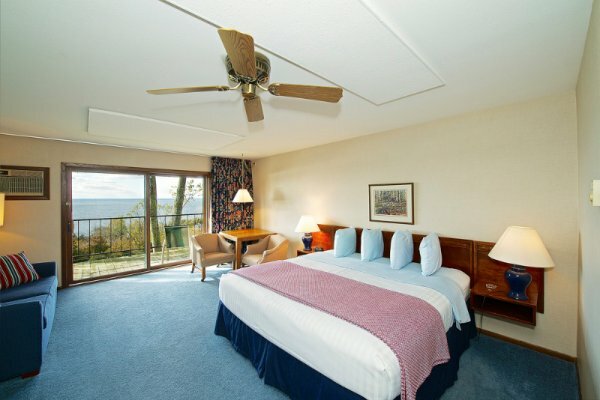 It is perfect for two couples or extra special for a honeymoon suite.